How did the remote control get so awful and confusing? The improved “Space Command” remote came with four buttons—power, tune up, tune down, and mute. This version dates from the 1970s. Photograph by Todd Ehlers/ Flickr. There’s an excess of buttons in my house, too—92 of them, to be exact, arranged on my nightstand in rubbery rows, seven different colors’ worth, with overlapping labels that range in tone from clear and aggressive (“POWER,” “FREEZE”) to meek and mysterious (“SUR,” “NAVI”). Following the model of usability expert Jakob Nielsen, I counted up the buttons I’ve actually pressed—not the ones I’ve pressed most often, but the ones I’ve pressed, period. The number was 34. I had a surplus of nearly five dozen. More striking was the fact that all my spare buttons were so densely packed into one corner of my living space. My home computer has 79 buttons. (I use almost all of them.) My clock radio has 15 buttons. My MP3 player and cellphone have five buttons between them. So why should my television, a simple device that’s not so interactive, spread so much clutter and confusion? Imagine if there were a separate door for each shelf of your refrigerator, and each of those doors had its own combination lock. That’s the state of the modern entertainment center, and the hand-held devices we use to manipulate it. The remote control was supposed to make life easier, but instead it’s led us into a labyrinth of bad design. How did we get here, and where are we going? The history of the remote, as it’s widely and improperly understood, began in 1950 with a Zenith device called the Lazy Bones. The new, hand-held thumb-clicker was attached to a set by a long cord, and allowed customers to “take it easy” by working a receiver from their seat. 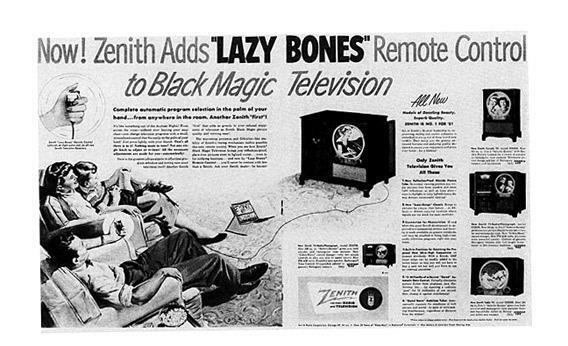 Ads called it “the greatest aid to relaxation and comfort that’s ever happened to television,” while behind closed doors Zenith execs referred to their marketing scheme as “the lazy man’s approach.” Their sales pitch worked: After more than six decades, the Lazy Bones is still how most of us understand the remote control—as a tool of relaxation and a means for doing nothing at all. In fact, the Lazy Bones was not the first television remote, nor can human laziness more than halfway explain the evolution of the device. Before Zenith, the remote functioned as a kind of patch for busted hardware, says historian Max Dawson of Northwestern University, , who is working on a book called The History of Television’s Futures. Early television sets had an array of dials that were tuned in aggregate to get a clear image—a process so frustrating that it spawned an industry of how-to books and magazine guides. One RCA television was so plagued by tuning drift, Dawson explains, that the company released a single-function remote controller in 1949—a separate tuning knob that viewers could manipulate from the couch. By this point, remote controls were already commonplace—for the radio. They began not as mass-produced accessories, but as DIY projects—the province of hackers, tinkerers, and backyard inventors. In the 1920s, as Dawson explains, hobbyist magazines printed instructions for building your own motorized, remote-controlled radio tuner. Here control was more important than remoteness: Amateurs could take command of their home electronics for the sake of better sound and signals. Eventually these efforts were repackaged as commercial products, and 12 years before the invention of the Lazy Bones, Philco released the first official wireless remote for radio—a rotary-dial device called the Mystery Control. The real history of the remote control, then, is one of competing impulses—to take control of your television and to never leave your couch, to hack and to lounge, to do something and nothing. The remote devices that followed the Lazy Bones were marketed not as a means of relaxation, but as a way to fight back against the network oligarchs and their commercial sponsors. By the mid-1950s, a backlash had formed against the excesses of advertising. (Vance Packard’s dire warning in The Hidden Persuaders arrived in 1957.) Consumers wanted to protect themselves against brainwashing ad-men, and remote controls offered a means of self-defense. First came the independently-marketed TV Hush and Blab-Off—a volume knob and a mute switch respectively—that could be manipulated from your seat. (The latter was invented by matzo magnate Howard Manischewitz.) But Dawson points out that Zenith, too, had a stake in the backlash: The company was pushing its own alternative to broadcast TV, an early version of pay-per-view called Phonevision. In 1955, it introduced the Flash-Matic—a wireless TV remote shaped like a laser gun, so viewers could zap commercials into silence. The Flash-Matic was a flashlight, more or less, to be aimed at sensors at the corners of the TV screen. Shoot one corner to adjust the tuning, shoot another to lower the sound. 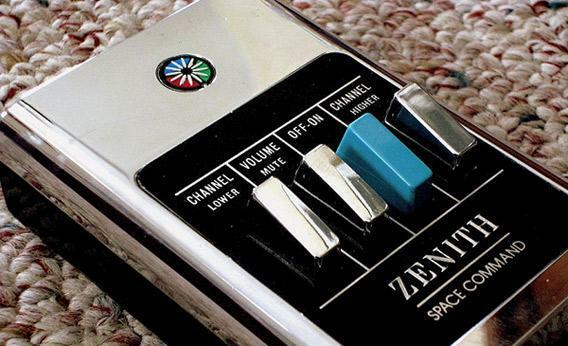 A year later, Zenith replaced the gun with the boxy Space Command, an improved remote with four buttons—power, tune up, tune down, and mute. Each press caused a hammer to strike a piece of aluminum and produce an inaudible, high-frequency tone that could be picked up by the television. Ultrasonic technology proved more reliable than the light-based Flash-Matic, and less prone to interference than the radio-wave remotes that had been tried before. For the next 25 years it remained the standard. Though adoption was slow, new designs for the ultrasonic remote emerged in the 1960s and ’70s. The Danish design firm Bang & Olufsen introduced a sleeker, steel-topped control box, and then haptic cues to make the remote easier to operate in the dark. Buttons that turned the volume or brightness down were concave, and those for turning them up were convex. 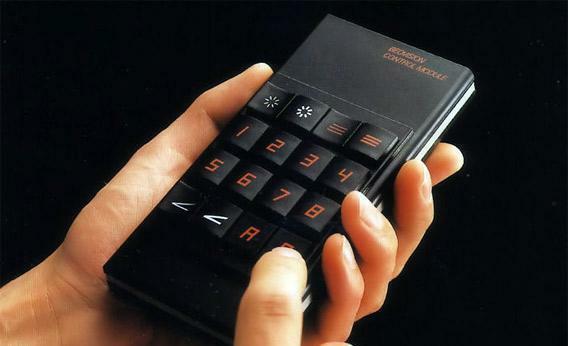 Still, by 1979 just 17 percent of American households had a remote. 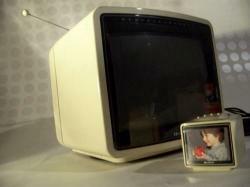 With the growth of cable television in the 1980s, the device became ubiquitous. Now the remote control didn’t just mute commercials, it cycled through long menus of programming. Remotes began to look more like switchboards, with dozens of buttons for all the available channels. The arrival of VCRs created the need for still more buttons—play, fast-forward, rewind—and gave remote control yet another purpose in the home. Academics took note of a newly-empowered television viewer, whose ability to channel-surf “must be seen as a crack in a tightly controlled political economic system.” Infrared technology replaced ultrasonic, and remotes were everywhere. At the end of the decade, more than two-thirds of all households had one. Photograph by Hollyce Jeffries / Etsy.com. As remote control spread, the device became a cultural icon—and its design turned more elaborate and whimsical. A company called Quasar released a line of multicolored Fashion Accent sets with matching remotes that looked like minitelevisions. (You could slide a photograph over the tiny replica screen.) American Standard, the toilet manufacturer, released a super-luxury, remote-controlled bathtub for $25,000 called the “Sensorium.” It came with a waterproof device that helped you control the taps, make phone calls, operate the stereo, and flip channels on your TV. For the mainstream consumer, the acquisition of each new piece of equipment—for playing videocassettes, laser discs, CDs—was marked by a corresponding hand-held device. Eventually these became so numerous as to be self-defeating. The lazy-bones viewer (who had by now been reconfigured as a “couch potato“) wasted effort rummaging around for the right piece of plastic. For the first time, we faced the problem of having too much control and too many remotes. Twenty years later, that problem has not yet been solved—which explains the 92 buttons on my nightstand. Indeed, the design of the remote control seems to have stalled out in the 1980s, an era of skinny rectangles and gridded keypads. Today’s devices have more rounded edges, like electronic éclairs, and circular keys for selecting from on-screen menus. But their major functions and foibles haven’t much changed. Meanwhile, Steve Jobs pushed Apple in the opposite direction, stripping away buttons and options, eventually creating a smooth, hand-held screen—the perfect hardware for lounging. While his former partner worked to tame a wilderness of devices and protocols, Jobs set up his famous walled garden. He put movies and music together in iTunes, and then—with the iPhone and iPad—he put iTunes right there in your lap. 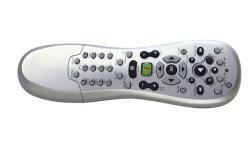 In the new Apple universe, nothing is ever remote, which makes the remote control obsolete. What now? It can’t be long before the computers in our pockets take over for the buttons on our nightstands. “In a sense we have to think about the phone as almost a universal remote control for your life,” said Microsoft CEO Steve Ballmer in 2007. Cellphones and tablets can stream video, and with the right apps installed they can serve as controls for your TV and stereo, too. The touch-screen interface comes with its own set of problems, of course—you can’t find the inputs with your fingers, or feel your way around. 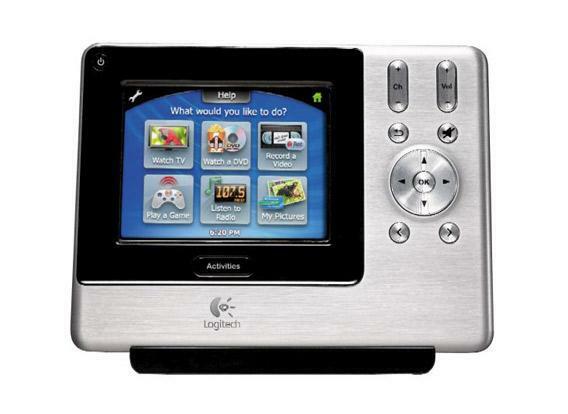 But maybe that’s the future of remote control: We started out with too many buttons and we’ll end up with too few. 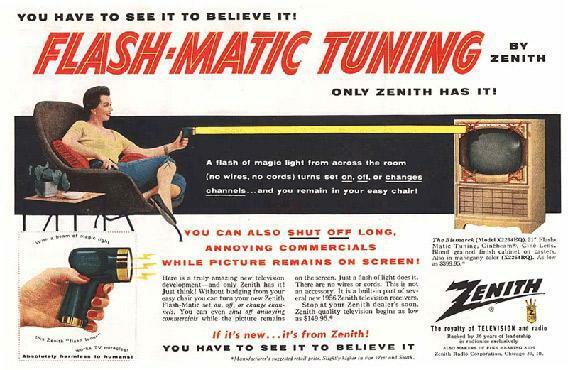 Clarification, Aug. 20, 2012: The original has been corrected to give more explicit credit to historian Max Dawson for the fact that radio remote controls began as DIY projects, and the idea that Zenith had a stake in the backlash against broadcast television.